Lawyers are using MyCase's web-based software to save time and money, increase productivity, and make their clients happier. 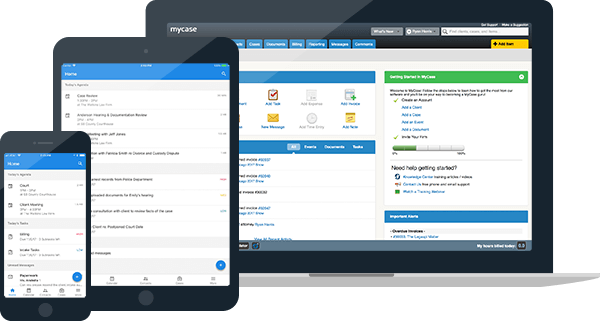 See how MyCase can help you grow your firm, start your 30-day free trial today! Is MyCase right for your law firm? "I have been using MyCase for almost 18 months and it is clearly the best decision I have ever made. Can't beat it. I am more organized than ever before." "MyCase has been a great service for me ever since I started practicing as a solo lawyer. It makes it easy for me to keep track of my cases, bill my time, and interact with my clients." "MyCase has transformed my office from a sloppy, solo practitioner with files and papers piling up, to an effective and efficient law firm."